FLASH SALE: Bitdefender Total Security 2015 30% OFF! 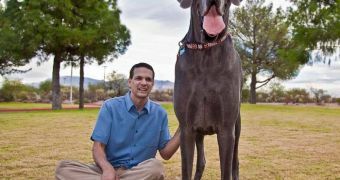 Giant George, a gorgeous Great Dane recognized in 2010 as world’s tallest living dog and the tallest dog ever by the Guinness Book of World Records, has died. He was supposed to turn 8 years old in a month and he died at his home in Tucson, Arizona, surrounded by the love of his humans. Giant George used his celebrity status to do a world of good so, while he was famous for his impressive size (39 1/8 inches [99 cm] and 245 pounds [111 kg]), many more people will remember him for the many charitable efforts he fronted throughout the years. 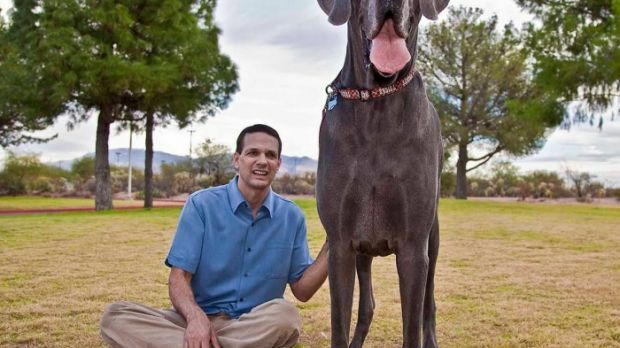 The Great Dane had lived with his human David Nasser since he was only a few weeks old, and it is Nasser who broke the news of his passing on Facebook. Yes, Giant George has his own Facebook page. “It is with a heavy heart that we announce Giant George died last night. George passed away peacefully surrounded by loved ones; one month before his eighth birthday. We appreciate the love and support you have given Giant George over the last several years. We look forward to honoring his spirit by continuing his charitable works,” reads the statement. “Humanoids, I am overwhelmed with the outpouring of love and sympathy expressed since my passing. My family, friends, and I can't thank you enough,” one of the most recent posts reads. “One of the overriding themes being communicated over the last several days is how to carry on the good will and charitable endeavors that have become the hallmark of my spirit… Just because my physical hugeness is gone, doesn't mean we can't continue to spread the love and have some fun along the way,” it further says. Giant George’s most recent posts link to websites with photos of puppies (and puppies and soldiers), various charity campaigns, and his book on Amazon. Judging from the replies he’s getting, he’s being missed terribly already. Share your thoughts on this story!